A Public Open House was held on July 19 in Rouss City Hall's 4th floor Exhibit Hall to explain the options and solicit feedback. Click the links below to view the information provided at the open house. City Council discussed the project at the November 8, 2016 Work Session. Both projects were approved at the November 22, 2016 Regular Council Meeting. The Valley Avenue Project would complete the sidewalk connectivity between Middle Road and the southern city limit and provide drainage improvements, especially near the intersection with Tevis. The proposed Hope Drive Extension Project would extend Hope Drive to Pleasant Valley Road and include the re-alignment of Papermill Road. The project would also either re-align Tevis Street with Paper Mill Road (option 1) or provide a cul-de-sac just east of Bradford Court (option 2). At the Work Session on November 8, City Council requested a detailed breakout of the estimated, long-term monetary benefits that the City will achieve if Option #2 is selected for the Hope Drive extension project. Option #2 would provide for a cul-de-sac on Tevis Street, just past Bradford Court. The following table summarizes the estimated long-term financial benefits the City will achieve with Option #2 as compared to Option #1. A more detailed explanation of each benefit is also provided. Construction Cost Savings: The total project cost would be approximately $1.2 million lower if Option #2 is selected because the realigned section of Tevis Street would not be constructed. Future Stormwater Benefits: If Option #2 is selected, the size of the stormwater management pond that will be constructed adjacent to the CSX railroad tracks can be much larger than in Option #1. This will allow the City to utilize the additional nutrient management credits that will be generated from the larger pond to meet future stormwater regulation requirements related to the Chesapeake Bay initiatives. 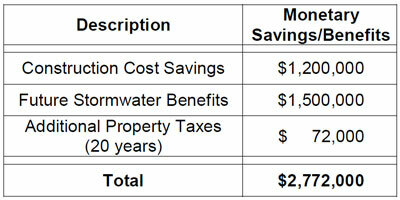 The estimated cost to build a separate stormwater management pond in another location to obtain the same amount of the additional nutrient credits would be approximately $1.5 million.